Not gorgeous! Reporting of our erstwhile Reserve Bank Governor Glenn Stephens is often deferential, maybe because he pulls the big lever on interest rates. 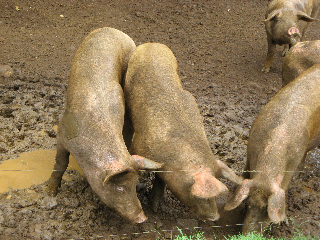 Executive salary feeding troughs are smaller for public servants, but there’s still plenty of room for serious porkish behaviour. Actually ‘gouges’ could also describe the Guv’s new improved salary – paid out of the public purse, rather than shareholders’ dividends in the case of corporate mega-porkers. At the risk of repetition KC will continue to report such excesses, as it’s a subject dear to our collective wallets. SMH revealed details of a $239,000 salary hike accorded by the RBA board in 2008, at the onset of the Global Financial Chicken, to reach $1.05m. Naturally it was done at arm’s length of the innocent beneficiary through the Remuneration Committee, composed of three non-executive directors. No doubt they are practiced in the usual dark arts of salary evaluation (mentioned before in news of Qantas CEO’s salary). As a yardstick, our PM earns $366,000, the Treasurer $289,000, and the head of the US Federal Reserve less again. The Guv (why not Governor-General, much more elevated!) showed unashamed chutzpah: ‘I take what I am given like anyone else in the country’. That’s what makes our econocrat class so useful: they know about maximising utilities, in their pseudo-scientific jargon (not so au fait with notions of propriety though). In simple language, homo economicus looks after number one, full stop. Actually ‘propriety’ appears in RBA’s own governance (for governors?) standards, and along with ‘integrity’ they define the required behaviour of Reserve’s board members. Treasurer Swan was ‘furious’ that the salary increase wasn’t notified to him for a year, but apart from a feeble letter, no knuckle-rapping or corrective action was taken – except flicking future salary evaluations to the Remuneration Tribunal. Meantime Glenn keeps his increase for another two years till retirement. Board accountability: zero! As for performance, the Reserve’s objectives are motherhood intangibles of stability, efficiency, prosperity, etc. And don’t mention the serious corruption by its money-making (of other countries’ bank notes) subsidiary – the RBA Board knew nothing about authorised bribes paid to overseas agents. As always, the managerial class just pigs out (see J Ralston Saul’s ‘Voltaire’s Bastards’). So keep those troughs topped up, and stand aside!